I'm the author of Column Subtraction and I would like to thank you for your kind review. You mentioned alternative algorithms and I have now two new apps for subtraction that use alternative algorithms: Partial Differences Subtraction and Trade-First Subtraction. For addition I have one alternative algorithm: Partial Sums Addition. 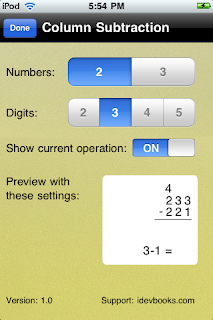 There is also a new Long Division app that uses the traditional algorithm.